I’m going to ignore the fact that FourSquare split in two, which at the time I called its “Qwixster” move. It was a terrible decision then, and it’s still a terrible decision. Since I only used FourSquare as a place where I would keep track of where I’d been, when I could no longer use it for that, I installed Swarm. I promptly uninstalled FourSquare and have never looked back. 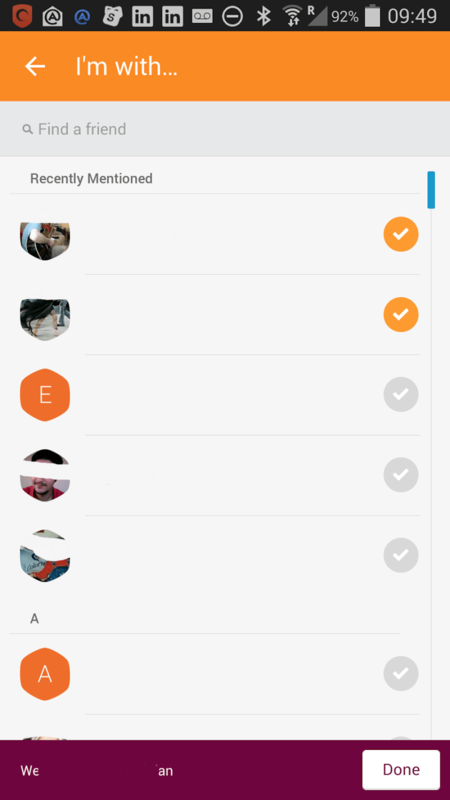 Swarm has been undergoing a number of UI changes over time. Their UI is a bright orange, and their error conditions are presented in a plum colour. (I’m not sure who decided on that combination, but if they were consistent, it might actually be effective.) They don’t use the plum colour for just error messages, but for all messages, so if you actually try to add your friends to check them in, the bottom portion of the screen shows a plum message, which I continually take to be an error, erroneously. It’s not an error there at the bottom. However, that colour is the same as for error messages. The first issue I’ve had with the most recent update concerns checking in other people. It used to be that if I wanted to check in someone else, I could just type their name. Given that I most often check in my wife, and I can circle out her name with SwiftKey, it was really simple to add her. (Even if her name wasn’t a circle, I’d only have to use an existing paradigm with which I’m already familiar.) At some point in one of their upgrades, that stopped working. I now have to click the friends icon, find her name (which goes to the top, in fairness, after the first time), check it, and then check ok. That’s three separate clicks for something I could once do easily with a circle/anyone could do with a swype. As you can see, the button is unobtrusively located in a reasonable place. It’s in the upper right, above the suitcase in the “Leaderboard” popover. When the popover disappears, the button is naturally next to the location menu. The button has now been moved to the lower right. Here it is covering the name and avatar of one of my friends. Here, the button is blocking the ads. If I were Starbucks, I’d be a tad upset that my holiday cups weren’t getting the exposure they’re supposed to, and for which I am paying. It also partially blocks pictures that my friends have taken, forcing me to scroll to see the picture. Good thing I don’t care how much those oysters cost. Good thing she let me know about the boat! I can’t see all of it, thanks to the terrible button placement. This is a tweet from the folks at FourSquare. Is it more android-like? I don’t see that it is really. I do know that it’s a poor design. Can I scroll in most of these instances? Assuming there’s more content, yes. That’s not always a good assumption. Should a person have to scroll to see the content? Only if it’s already off the screen. There shouldn’t be floating elements blocking it regularly. PreviousI Get to Celebrate Father’s Day Next Year!